The much-anticipated Sigma 85mm 1.4 DG HSM Art lens is now available for the Nikon mount. Sigma announced the new art lens at Photokina this fall. Most photographers consider the 85mm as a go to lens for portrait photography. Early reviews have been fabulous. So far, everyone who has tested the new 85mm 1.4 DG HSM Art lens has been impressed, particularly with the quality optics and performance. Some reviewers consider it as an upgrade alternative to the Nikkor 85 mm 1.4 lens. Sigma’s new lens is designed for high quality portraiture. It features a totally revamped optical design that incorporates 14 lens elements in 12 groups. Overall, the image quality is sharp, delivering stellar images starting at f/1.4. As Sigma notes, a nine-blade rounded diaphragm “creates beautiful background bokeh to isolate and accentuate the subject.” The autofocus of the 85mm 1.4 DG HSM Art lens is also significantly faster than previous generations. The new Hyper Sonic Motor (HSM) of the 85mm 1.4 DG HS boasts 1.3 times the torque. As previous reviews have noted, the lens is a beast. It is well-constructed, but that also means it is also a bit heavy, weighing it at 1.7 pounds. Some early adopters have also noted that the lens severely front focused out of the box, while others had no issues. It’s unclear if its user error or a quality control issue. Like all f/1.4 or f/1.8 lenses, the most optimal stop is usually 2 stops higher than fully open. So the f/1.4 open to 2.0 or 2.8 is likely to produce the most optimal sharpness. The early reports for this lens is that these stops are extremely sharp. 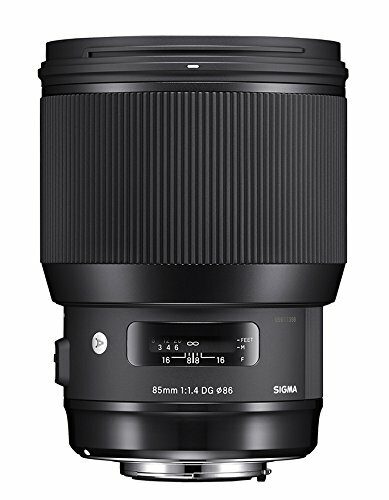 The Sigma 85mm f/1.4 DG HSM Art Lens starting shipping November 30, 2016. It retails for $1,199.00. It is available at a variety of online sellers, including Amazon.com and BHPhotoVideo.com.